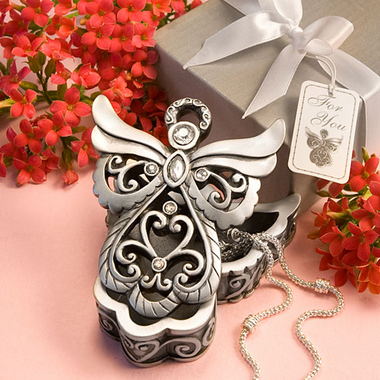 These angel design First Communion favor boxes are a heavenly gift for your guests. A nice way to commemorate your First Holy Communion, these curio boxes can be filled with fun little items from jewelry to coins. Each measures 3" x 2 ?" x 1" and is made of sturdy poly resin (a form of plastic) in a silver/pewter finish. 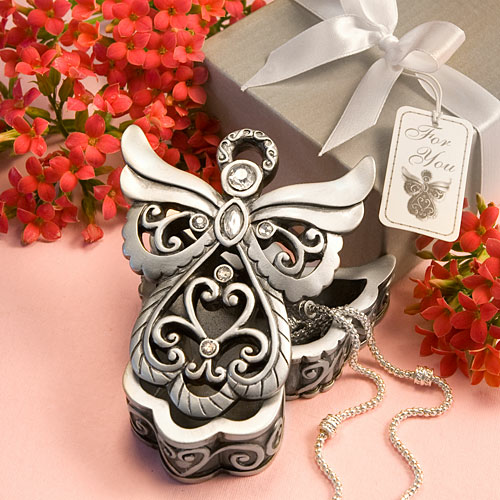 Each angel shaped First Communion box has a solid filigree base with a removable cover that has a detailed angel design with filigree swirls and assorted shaped rhinestone enhancements. Each comes in a satin finish silver box, tied with a white satin bow and an attached angel themed ?For You" tag.